t*rexes and tiaras: Tuesday Titles 050.. It's been a while since I began reading a book and really didn't want to put it down. I remember this being one of Alex's picks when she went to the reading spa at Mr B's and ever since then I'd been meaning to ask if I could borrow it. Finally, I got around to it and I'm glad that I did. The Night Circus is exactly what it says it is. A circus, made up of spiralling tunnels linking a maze of tents, each housing a different wonder. It opens at nightfall and closes at dawn, according to the sign which arrives with the circus. Little do the visitors know that there is a war going on between two of the most powerful enchanters in the history of the magical world. The night circus provides the perfect war zone for the game to be played, although it is never made clear exactly what this game involves. Only one of the players is aware they are even playing a game, and she doesn't know who her competitor is. Nevertheless, amidst the confusion, the magical world draws you in with great success and the book kept me enthralled right up to the end. 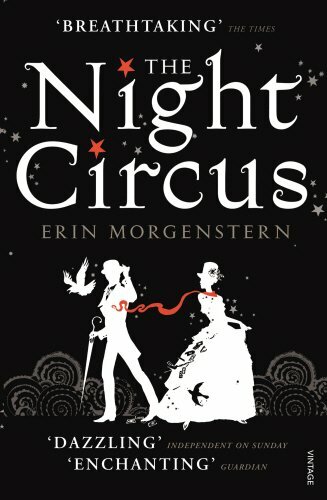 Have you read The Night Circus? What did you think? Reading anything great at the moment? I read this a few years ago and found it utterly delightful! I read this for book group and hated it! I thought I'd enjoy it but couldn't get into it at all :S I think I am the only one who doesn't like it though! Oh, it's always interesting to hear when people don't like something which has been really popular =I really didn't like Sister, Room or Gone Girl. And I seemed to be in the minority with all of those. It has been on my want to read list for sometime! Its sounds amazing..one day i may even read it! Thanks for your comment - if you get chance, it's certainly worth a read! I read this expecting to love it. I didn't. I thought it was OK but I didn't feel it lived up to the hype, I found some of the descriptive passages so long and drawn out, I just wanted it to get to the point. That's another one I really want to read - Rebecca!